There are several different options for folks who want a home batting cage just nets, just frames, batting cage kits or the most popular choice - complete batting cage kits. Complete backyard batting cage packages include everything - all of the poles, ground stakes, fittings, hangers (if applicable) and, of course, the netting. If you want to hold costs down on a steel batting cage, definitely consider one of our discount batting cage kits instead of a full batting cage package. Please select from our excellent selection of everything-included batting cages, below. Be sure to scroll to the bottom of the page after the products to see some common questions we get about our batting cages for sale. What's the difference between the Heater batting cages and the Cimarron batting cages? The main difference between Heater batting cage packages and the Cimarron Sports ones is that Heater cages have fiberglass supports and Cimarron cages use steel frames and arches. Steel is certainly more durable than fiberglass, so you can expect a steel batting cage to last longer than a fiberglass one. 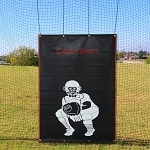 Although both are relatively easy to set up, the Heater batting cages are the easiest of all to set up and take down. No tools at all are required. If you need the ability to quickly set up and take down a cage, the Heater batting cages may be your best bet. Finally, cost is always a factor. 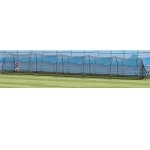 The Heater batting cages are considerably less expensive than similar sized Cimarron batting cages. 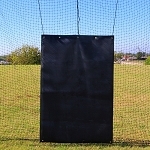 What is the difference between the Heater Home Run, PowerAlley and Xtender batting cages? We get this question a lot. So much, in fact, that we created a whole article about it in the Resource Articles section of our website. 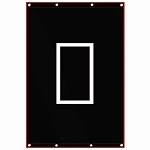 Click here to read What is the Difference in Heater Batting cages?